Truthfully, until recently I haven't given much thought to the design of my dream barn. However, Bob assures me that winning the lottery is inevitable, because he buys several tickets a month. It's pretty much in the bag, so I've been thinking and looking around. I love the exterior design of the barn to the right, and think Harv and Riley would approve so long as it was tastefully landscaped. While stunning, the interior is less to my personal taste. Judge for yourself at the Blackburn Architects portfolio page. What do you think? Check out the links below to high end barns and tell me which ones you like, and why! Dutch doors facing outside, with grillwork and options to close off in winter. Stalls that open out to individual paddocks, or at least nearby access to paddocks. Not sure what footing to use on those areas, though. Open, airy stall design, grates between stalls. High ceilings everywhere, including wash stalls. No protruding ceiling lights! Recessed lighting wherever ceilings are low. Chutes from the hay loft to each stall, if the hay is not stored separately. Cross ties in each stall, not in the aisleway. Asphalt and concrete flooring is cost effective but scary. Harv slips every time he walks down the slight incline in his barn aisle, and recently I had a horse slip and fall on concrete (he spooked). The barn on the right, by Blackburn architects, seems like a nice solution. It looks like a mat to me, but it could be rubber paving stones. Attached paddocks, I think, are essential for a dream barn. Those are quite the barn pics. My barn is about 75+ yeaars old and looks nothing like those! I would very much like to steal some friends of my family's barn. It has sliding metal-grill doors on the inside, and dutch doors that open to the outside. The dutch doors open to the dry lot, which actually stays dry because it's pea gravel on top of that weed proof landscaping fabric. The dutch doors are also under a 10' or 12' overhang that keeps the rain out of the stalls even when it's pouring and provides shelter and shade to the dry lot. It wasn't horribly expensive to do, but it was really well planned. Personally? While having cross ties in the stalls is convenient, I'd be paranoid my horse is going to get hung up or injured on the things. Protruding hardware and long ropes just seem like an accident waiting to happen. When they are in the aisle or a grooming stall, they are out of the way, but in the stall itself is just too nerve wracking. Then again, he's an 18 hand cross bred with a curious active mind and wouldn't leave them alone. A note about barns with outside dutch doors. It's been my experience that they tend to be colder barns. Nice in the summer but brutal during a New York winter even with the dutch doors shut. In a hotter climate, I could see the advantage though. I'm of the opinion that you don't leave horses unattended in cross ties for more than 2-3 minutes. Having been in boarding barns where people park their horses in cross ties and wander away for 45 minutes, the notion of in-stall cross ties appeals to me. I also like having the aisles clear. Once Harvey bolted and ran down the aisle where 2 unattended horses were cross tied. Not pretty. If the barn manager makes rules about unattended horses or hour-long grooming sessions, aisle ties are fine. Hey, if you're going to have a horsie mansion, why not have grooming stalls? They're out of the way, keep the aisles clear and you don't have loose crossties/crosstie hardware in a stall where the horse is living for how so long he's in the barn. For awhile, we had an extra stall in our barn that we used as a grooming stall. It had stall mats but no shavings, a window, and the back Dutch door so the groomee could stand and watch out the windows while being groomed. It was right on the corner of the barn, and a great place to put a horse awaiting a vet visit or awaiting massage, chiro, trimming, etc. 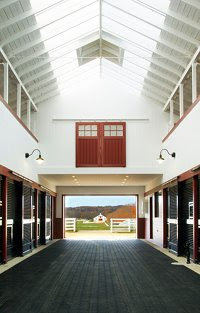 If you need more ideas, google Southern Pines realtors and horse properties - you'll find some pretty fancy barns. We don't even buy lottery tickets but I dream anyway! I'm ridiculous: I want my house to be a small log-cabin style home with a loft for the bedroom and a very open floor plan. (Only closed rooms being the bathroom, and maybe a second bedroom [kid or guest room?]) I would actually be fine living with an out house, water I have to pump, etc. My goofy 2yr old had a BAD washdown slip this weekend. He managed to get in a place w/o matts and down he went, while in cross tied. Not only did he get cut, but scared himself very badly and now we have trauma getting into the washstall... ugh. Interesting. The barn you pictured has a wooden floor in the aisle. Wonder why? Small for me too as the more stalls the more horses I'd have and three is fine, thank you. Grooming stalls are a great idea. My dutch doors open to the paddocks, shared by everyone. If I had more land, there would be individual paddocks for restricted turnout if needed. I have run in roof overhangs on both sides and that really helps offer protection in the stalls. Were I building again and if I had the money, I'd add an indoor wash stall, a larger tack/tool storage area separate from the feed room. And somehow, I would figure out how to control the mud around the barn itself. And then....I'd add an indoor arena, of course. Attached to the barn by a covered walkway. Enough. Where did I put that lottery ticket??? WOW! 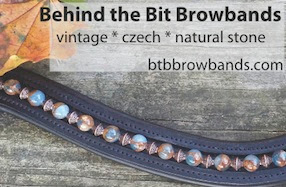 Thanks for the great article & the many links! I can't wait to explore them all!